This dish pretty much screams “Springtime!” With fresh basil and kale, nice ripe cherry tomatoes, and crisp asparagus, it’s basically spring in a bowl. And such a delicious refreshing change from tomato-based pasta sauces! It also comes together in less than the amount of time it takes to boil water and noodles, which is something I like in a pasta dish. 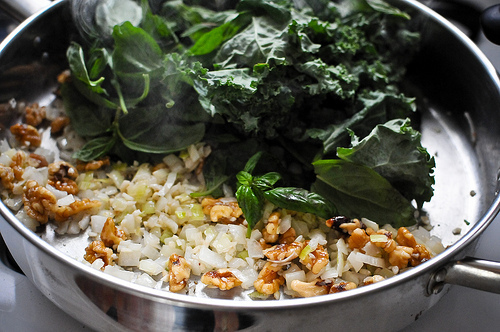 You start with a big skillet and toss in some chopped onion, walnuts, kale, and basil and let them get nice and toasty for about 5 to 8 minutes, until the greens have wilted just a bit. Remove all that stuff from the pan and pop it in the food processor. Put the pan back on the stove and add some 1-2 inch pieces of asparagus and a bunch of garlic and let that heat up until the asparagus is softened but still has a bit of a crisp to it. While that is cooking, go back to the food processor that’s holding all your pesto-ey goodness and add a bit of water and some nutritional yeast if you want a cheesiness factor (but it’s not strictly necessary if you don’t keep nooch around, don’t go buy a big ol’ tub of it just for this). Blend it up until it’s nice and smooth – it can have a somewhat paste-like texture because you’ll be mixing it up with wet noodles to help it spread out. Once you’ve blended up your sauce and cooked your asparagus, just slice a few cherry tomatoes in half (or a regular tomato into chunks) and toss it all together with your noodles. (Oh yeah, you should have been boiling noodles this whole time. Did I forget to mention that?) When you drain the boiled noodles, make sure to reserve about a cup of the boiling water – as you toss the noodles and pesto stuff together you can add it a little at a time to get it all smoothed out and coating the noodles. And ta-da! You’ve got a bowl full of delicious and nutritious springtime goodness. Anyone have any favorite recipes that feel like spring to you? Or any favorite non-tomato based pasta sauces? I fall back on marinara a little more often than I’d like so I’m working on expanding my repertoire. Start a large pot of water boiling, and cook your noodles according to the package directions. When you drain the noodles, reserve a cup or two of the water to add to the pasta. Once the greens and walnut mixture is ready, remove it from the pan and add it to a blender or food processor. 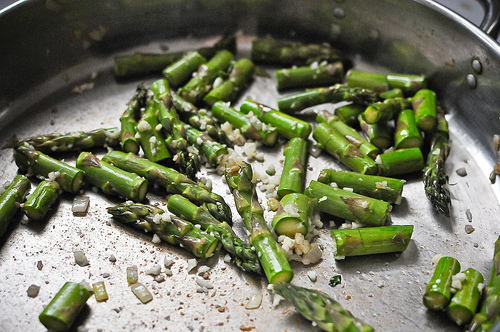 Return the pan to the stove over medium heat and add asparagus and the rest of the garlic. Heat the asparagus for 3-6 minutes until it is softened but still somewhat crisp. While the asparagus cooks, add water, salt, and nutritional yeast to the food processor with the cooked greens and blend until smooth. 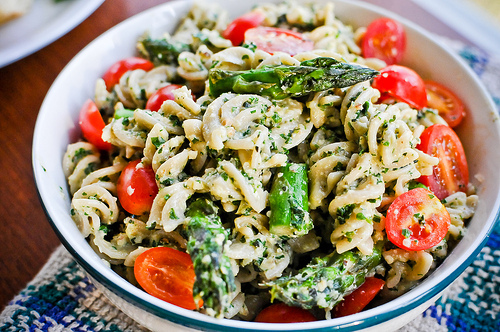 Once your asparagus and pasta noodles are ready, combine all ingredients in a large bowl, adding the reserved pasta water to help the pesto coat the noodles. Serve warm or cold. 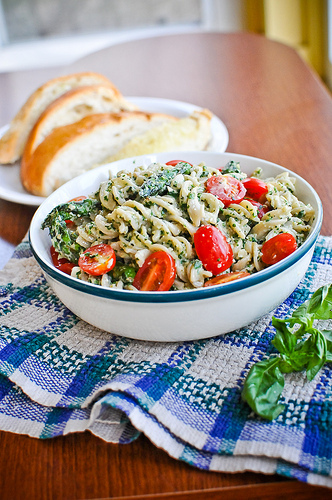 This looks great – will definitely be making as soon as I get my hands on some basil! What a delicious looking pasta sauce! I’ll absolutely have to give it a try! I just recently fond your blog and I am in love. I’m vegetarian myself and have quite a number of food sensitivities, and the food you make here seems to avoid most of them! unfortnately I myself have absoloutely no self control whatsoever so I always end up making things that are jst awful for me, so I hope your blog inspires me to get healthy and ditch the junk! I hope so too! I also have terrible self control, which is why I’ve given myself so many strict rules – if I let myself bend them a bit I tend to overdo it and make myself sick, too! This sounds super tasty! 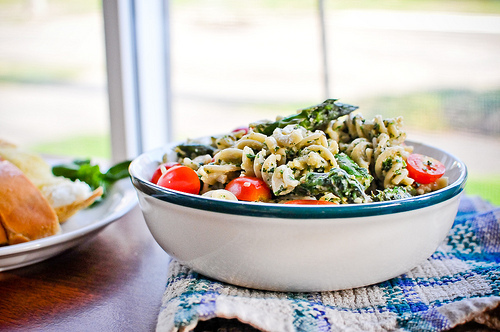 It’s funny, I’m not a very big basil lover either, but I adore pesto in pastas! They were just meant to be! i love to eat kale all year round, and i love your use of it here. what a delicious, healthful meal, and it’s also gorgeous! Hey Jessica, I just found your blog today and I must say how excited I am that I did. My husband and I made the choice to ditch animal proteins, processed sugar (and as many processed foods as we can) and we’re working on limiting gluten intake. It’s CRAZY how much better I feel, my hair is glowing, and I have so much energy. Anyway, it is HARD when everything around you is supporting consumerism and companies who want a pay day. Even buying vegan premade sausage- I wonder how many carbon emissions went out while this package was being delivered to my store. Anyway, I am a photographer myself (though not so good at food styling) so to find a blog that cares about all the same things I do AND has beautiful photos to boot? This looks fantastic. I just made pesto for the first time a couple of weeks ago and have been looking for more recipes. Thank you! Not a huge pesto fan because of the basil being so prominent, but it was quite good. Think if I make it I may play around with it and see about using another herb in place of the basil…..any suggestions? This looks absolutely amazing!! I love pesto, but hate the steep price. I’m so glad to find a cheaper recipe that I can whip up myself! What a fresh and delicious salad!!! I like how you use the kale here. Beautiful pictures! 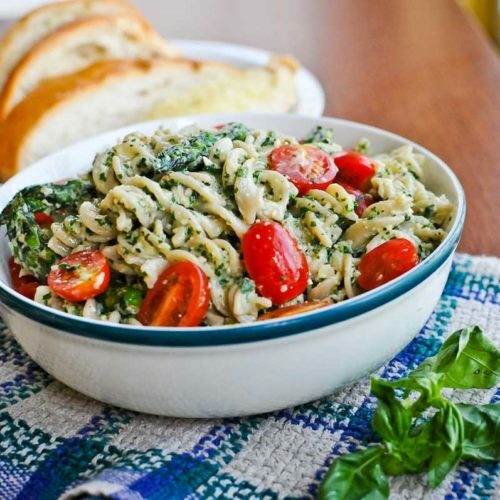 I love pesto and your recipe sounds delicious! WOW what a gorgeous bowl of healthful inspiration!!! Thanks for sharing! Hi Jessica, I made this today. Viewed your pics this morning, trip to the market the afternoon, and dinner tonight. I absolutely loved it! I rarely use kale except for soup so this was a new creative way to get it in the diet. The flavors were wonderful, onion-garlic-walnuts incredibile. I added a little sharp pecorino instead of the nutritional yeast and used a twisty tube like fat pasta to hold all of that wonderful pesto. I love basil but agree sometimes it can be too much. The kale was a nice change. This will definitely be a staple for the warmer months. This looks super good!! 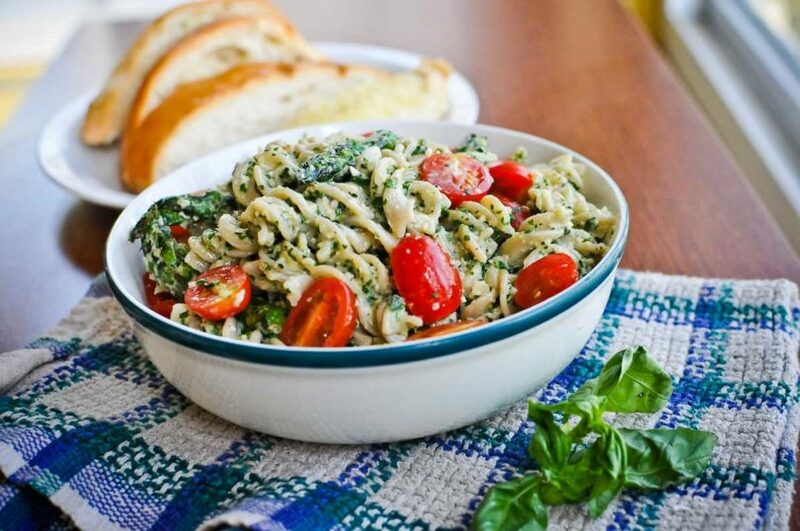 I love mixing up the traditional pesto and this recipe sounds so very tasty and good for you to boot!! i just want to say that i made this today and it was SO GOOOOD thank you so much for sharing! So I am generally a very healthy eater, but in preparation for an upcoming marathon, I am really focused on clean food. I prefer to eat mostly vegetarian, but I also need to keep my meat-loving boyfriend in mind when cooking for the two of us. The beauty is that he is very open to trying new things. I made this recipe last night, using on-hand raw cashews instead of walnuts, and it was DELICIOUS. The pesto had a subtle nutty/creamy flavor to it and the brown rice spirals held onto it really well. I can’t wait to have my leftovers for lunch! Plan to try it soon! What a lovely variation on regular pesto and your photos are beautiful. 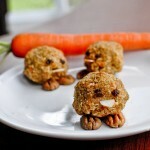 Lovely, delicious-looking recipe and photographs! We would like to feature your recipe on our Facebook page on June 22, with a link back here so people can see your recipe and photos. Come LIKE us on Facebook….we <3 kale! Great idea! 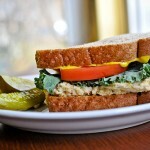 I love finding new ways to incorporate kale into my meals and this is one I had not thought of! !